Halil Erdogmus is the founder and owner of e-bebek.com, selling baby and kids products on the internet and retail stores. e-bebek is the market leader in its sector. Before this venture, he was the General Manager of Ermet Mensucat Sanayi ve Ticaret A.S. He built up this company for producing 100% cotton scarves, a first in Turkey. He played a major role in production, budgeting, marketing and planning operations. His professional roles before that include Business Development Manager at Benkar Tuketici Finansmani ve Kart Hizmetleri A.S., Vice Chairman at Erteks Tekstil and Operations Associate for General Banking at Turk Mitsui Bank. He is also the owner of Ersigorta, an insurance broker company. 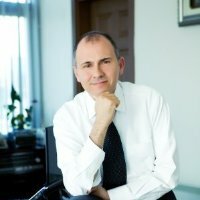 Mr. Erdogmus holds a master’s degree from the University of Istanbul, with a thesis on “Management Difficulties in Small and Medium Sized Companies”. His BA degree is on Economics, again from University of Istanbul. He is married with one daughter.